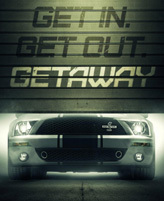 Review: Getaway / It's Just Movies Review: "Getaway"
Everyone loves a movie with cars and action. The most successful recent movies of this genre would be the “Fast and Furious” series and “Drive.” After watching “Getaway” Monday night, it is evident what makes those two movies stand out from the pack. The “Fast and Furious” series works because of believable characters. Vin Diesel is perfect for the lead, as is Michelle Rodriquez. The “Fast and Furious” series also provides us with great visuals and directing. “Drive” is by far my best film in this genre because Ryan Gosling played a superb role in this film and once again the story and directing were phenomenal. “Getaway,” sadly, just does not have the elements to be a great film in this genre. It fails on too many levels. “Getaway” stars Ethan Hawke as Brent Magna, a man forced to steal a Shelby Mustang Super Snake and take orders from a mysterious voice ( Jon Voight) in order to save his wife. Hawke is aided in his journey by Selena Gomez. I wanted to love this movie because I have a celebrity crush on Selena Gomez and, unfortunately, that was not enough to enjoy this film. Gomez just did not play a very good role in this movie. She played a wannabe-thug-who-is-really-a-tech-geek, and starting with her first appearance as a thug in the movie, I could not help but laugh because she was trying to steal her own car back with a gun. Gomez was not very convincing as a car thief and her role throughout the film never got better. Hawke’s performance was more disappointing because he is a seasoned actor. His character just seemed boring and robotic, and Hawke and Gomez had zero chemistry together. Voight was the top performer in film and although you just hear his voice, he still does an awesome job. Overall, “Getaway” is a horrible mix of “12 Rounds,” “Drive” and “Taken.” For movies in this type of genre, it is difficult to bring new ideas to the table because we can expect to see two things: 1) Car chases and 2) a predictable story-line. The car chases in this movie were nothing we have not seen before and, in fact, half the movie repeats itself with the lead characters being chased by police cars. Getaway is filmed 99 percent of the time in the car and it would have been nice to have a break from that. The plot was also something we seen before (“Taken” and “12 Rounds”) with a person getting kidnapped and then having to follow instructions to see that person again. The plot is very predictable and was even guessed by my friend 15 minutes into the movie. “Getaway” – which parks in theaters Aug. 30 – is ultimately little more than an over-long Ford commercial. Sadly, I have to give this film one out of five Ford Mustangs. I screened this film last night and was very disapointed in it. Not only was it too simplistic in its story-line, but the characters weren’t believable and lacked chemistry. Another thing which makes the Fast & Furious franchise so popular is exotic locations and showcasing tons of awesome cars. In “Getaway” there is 1 car -in which 95% of the film takes place- and mostly at night. The movie feels as if it was shot with a GoPro camera and it really cheapens it. Looks like Ethan Hawke will not be continuing his streak of successful films released in 2013.